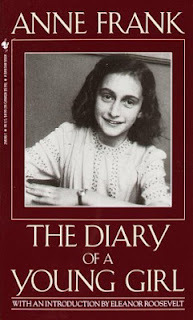 I was just clearing out my bookshelf, when I found this battered old copy of The Diary of a Young Girl. I re-read a few dozen pages of the book and realized that though growing up did (thankfully) affect my opinions in various ways, what I feel about this book is still the same. The first thing people say when I tell them I'm not the biggest fan of this book is that I should consider that she was only a child when she wrote it. I have always felt that people underestimate children once they grow up. I read Anne Frank's diary when I was twelve, probably younger than she was when she wrote it, and I found it as silly then as I find it now. It was chilling to think of someone my age in a situation as unsettling, it was odd how immature her writing made her seem. Everything has gotten much worse here. But you already knew that. Now God has sent someone to help me: Peter. I fondle my pendant, press it to my lips and think, "What do I care! Peter is mine and nobody knows it!" With this in mind, I can rise above every nasty remark. Which of the people here would suspect that so much is going on in the mind of a teenage girl? Is that really "so much"? My 12-year-old self didn't seem to think so. I must have considered my having been through much less with what seemed to be a much greater measure of maturity, when I called the diary 'shallow', 'boring'. Now, re-reading the book I found it endearing that Anne Frank never seemed to lose her innocence throughout all that she had to go through. She managed to remain silly, stubborn, judgmental, overly sentimental and it's tragic, that that was all she ever was. I know that she wanted to publish her diary later herself, but I think forty years from then, had she survived, she would have considered it fondly, perhaps but, found it kind of silly herself. That she never had the chance to grow up, along with a thousand others, for no fault of her own is indescribably awful. But the extraordinary circumstances of the book don't change the fact that it is little more than the diary of an ordinary young girl. 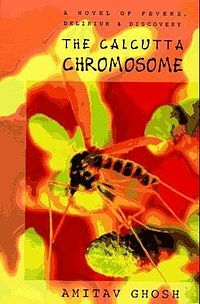 I wasn't sure if The Calcutta Chromosome was science fiction, until I read that it won the Arthur C. Clarke award. It is a fictionalized account of Sir Ronald Ross's breakthrough in the research regarding the cause and cure of malaria. Summary: The novel opens in the future and we are introduced to Antar (and Ava, his super high tech computer.) Antar is looking into the disappearance of a certain L. Murugan, whom he had met many years ago ago. And so we are transported many years back, to Calcutta, India, where Murugan has arrived tracking a conspiracy surrounding Ronald Ross and his malaria research. Through Antar's investigation and Murugan's travels, the pieces of the puzzle begin to fall in place. Ronald Ross is supposed to have been helped reach his breakthrough by an underground group of natives. But this mystical Indian group was aiming for something even higher and they did achieve it - an eternal life or reincarnation of sorts, using what Murugan calls the Calcutta Chromosome. My thoughts: This book is so odd and so terribly fascinating. It may be science fiction, but it also belongs to the genres of historical fiction, suspense, horror and fantasy. The book has been called too vague or pretentious, but I don't agree with that. It is slightly hard to follow the twists and turns in the plot and the varying timelines, but it makes a good point. I like that the entire theme of the book is repeatedly thrown at you in conspiracy buff Murugan's entirely out of place teenage lingo. I liked his character, it's just typical enough to be perfect! People don't surprise you as often as you'd think and Murugan's characteristic humour in the most inappropriate times (the best kind) has really kept the book fresh. The few other characters are also quite engaging. Ghosh has shown their traits and manners mostly through dialogue and at times put you right into their minds. It hardly takes a few pages before you begin to relate to Urmila and Sonali and are soon wholly involved in their intertwined stories. I enjoyed the writing as well, though there were moments when it was a bit clumsy. At one point a man mentioned "the-one-who's-at-home", and I literally laughed out loud! The word Ghosh had in mind was a Bengali version of "gharwali", I suppose, and it is a cheesy, villager-like way of saying 'my wife'. Translating word for word from your language is sort of a rookie mistake, isn't it? But four words that seemed out of place didn't really matter to me quite as much, when I considered the whole book. The atmosphere created was fabulous. The descriptions of Calcutta in the late 90s were mesmerizing. I could even picture myself standing right there on the dirty but homey streets of the city with Murugan by my side. The mystical Indian society and their reluctance, impatience even, when dealing with the British, the secrecy surrounding their strange customs, Murugan's undying curiousity, the eternal thirst for knowledge, not to mention, that "Eureka!" moment are all portrayed wonderfully realistically. Though I cannot guarantee you'd love it, I do think the book is worth reading! I didn't exactly plan this, but I guess this counts as my second read for the 2013 Sci-Fi Experience.